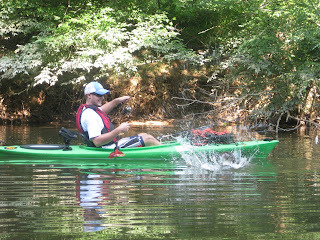 Last weekend my neighbor Paul and I hit the river for a Saturday morning trip. I love fishing with Paul for many reasons, but the two biggest are 1) he has a newborn and I know his free time is rare and 2) Paul and I know more random facts than anyone should ever know, so our conversations typically lead anywhere and everywhere. We hit the water around 6 AM and began our float. It was Paul's first time in a yak in years, so it took him a little while to adjust to the 10 foot sit-on-top. I started throwing a Lucky Craft Gunfish while Paul threw a topwater frog. I had a small fish boil on the Gunfish and Paul had another boil on his frog, but we had no real takers. I then switched to a combo of a Cotton Cordell Big-O crankbait and a Deep Creek Lures worm and Paul switched to a white spinnerbait. The first bite of the day was a big one as a nice largemouth pulled drag from Paul's spinning combo. As the fish breached the surface, we could both see that it was well over 4 lbs and possibly over 5. He fought the fish for another 10 seconds (although it seemed like minutes) before it threw the hook. This fish would somewhat epitomize our day. I caught my first fish of the day on the crank, a 1.5 lb bass, to get the skunk out of my boat. 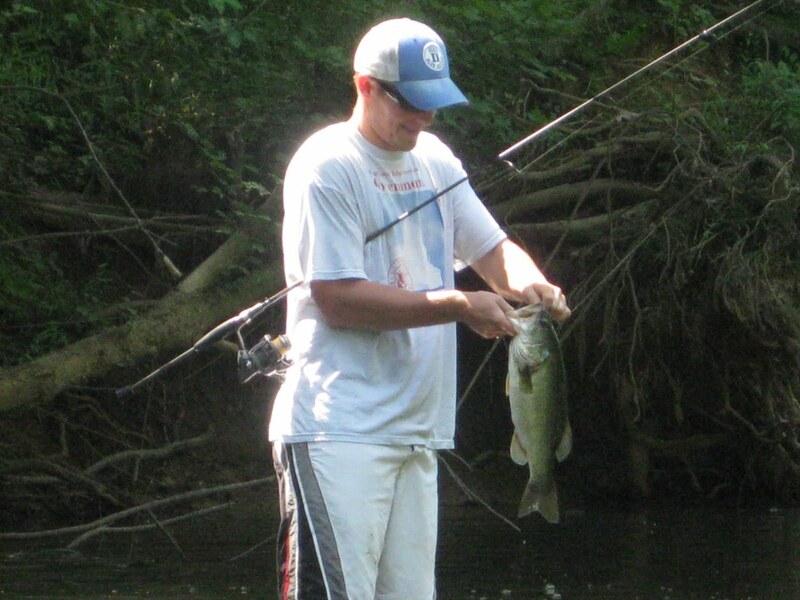 We continued up river and hooked some fish on the worm and spinnerbait. We had boated a few, but nothing to brag about. I actually caught my first catfish of the summer on the Deep Creek worm, but even he flopped off as I pulled him from the water. We arrived at the top of our float landing only 5-6 fish and we were both a little perplexed and frustrated. While wading a shallow pool, Paul and I did manage a double as he landed as small bass and I a sunfish who ate a worm nearly as big as him. As we turned and headed down river the bite started to pick up. I switched from a Deep Creek worm to a Gary Yamamoto worm in one of my favorite shades of green and it seemed to make a difference. 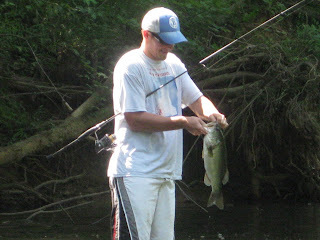 I caught 7-8 bass in a short stretch, including 3 on consecutive casts at one point. However, the big bite still escaped us. Conditions continued to change as early afternoon storms were blowing in. The bite ran hot and cold, but we got bites somewhat consistently. I was landing fish every 10-15 minutes, but they were all fairly small or coming unbuttoned. Finally, I threw my worm along the base of a tree and it got hit hard. The fish took off toward deep water and I could feel the head shake of a nice bass. Seconds later the hook popped out and my tough day continued. Paul was also getting some bites, but having trouble putting fish in the boat too. We approached the launch knowing that we had to soon call it a day in order to avoid the dark clouds that were blowing in. It was then that I got a good bite and finally landed one of my best bass of the day. For the next 30 minutes we fished in fear of getting rocked by the storm, but the bite really picked up. We started getting bit every other third cast and were landing some 1-2 lb bass. I lost a nice fish in a mess of trees and Paul soon boated a 2.5+ lb bass. He then hooked another that was a little camera shy and flopped off before he could land him. Paul hooked a couple more before we had to call it a day. We put the gear in the Escape, threw the yaks on the roof, and jumped in the car. By the time I turned the car on the rain started and within seconds it became a torrential downpour. I have to credit Paul for that as I wanted to fish another 10-15 minutes. 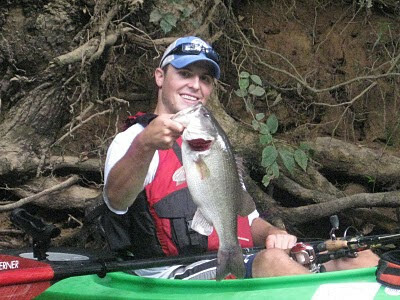 Paul caught fish on a spinnerbait as well as a wacky rigged plastic worm. I caught all of my fish except 1 on plastic worms and, although I love supporting local products, the Yamamoto worm outfished the Deep Creek worm (both the same style) approximately 17 to 3. While I believe the changing weather conditions had something to do with those numbers, it is hard to argue with success! Thanks again to Paul for joining me on the water. Until next time, tight lines! My anticipation had been growing for some time for the RiverBassin Tournament based out of the Bass Pro Shops in Charlotte. 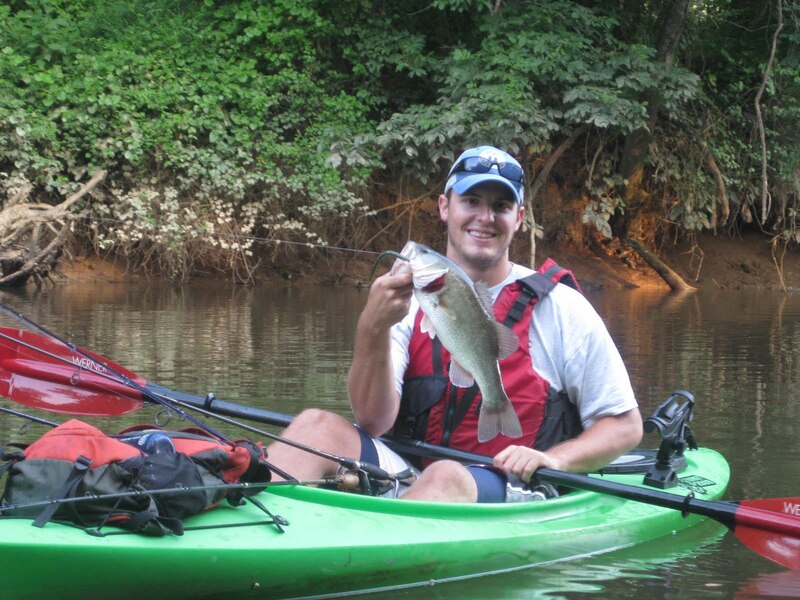 I grew up fishing for bass on the rivers of central Pennsylvania and spend a ton of time on the rivers and streams of North Carolina...so I was pumped. Unforunately, my favorite river was just out of bounds for the tournament and I wrestled all week with exactly where to fish. The day before the event I headed down toward the South Carolina border to check out a stretch of the Pee Dee River. I had never fished here before, but I had faith and it looked like it had potential. My mistake was getting out of Durham late, which put me on the water around 11:30 AM in 98 degree heat. To make matters worse, the dam above this stretch was running no water and the river had dropped a few feet over the 24 hours prior. Needless to say, the bite was slow, but I managed a handful of largemouths with my best three going 19", 16", and 12" for a respective total of 47". However, that was not the number I was hoping for. I headed to BPS-Charlotte as confused as ever. Would the fishing be really good in the morning if the dam was releasing water? Would I be able to get a few decent fish during the morning bite? Should I stay close to home and stick to my guns? 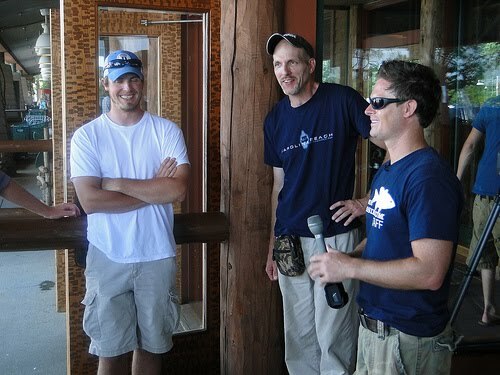 In the end, I decided to fish with my good friends Bob and Joey as well as Bob's dad Parker. The river was one I know well, but I had never fished this particular stretch and going in blind would come back to cost me. After the captain's meeting, a long drive home, an hour of prepping gear, and 3 hours of sleep I was on the road again headed for the river. We launched at first light, which I guess is debatable depending on who you are. 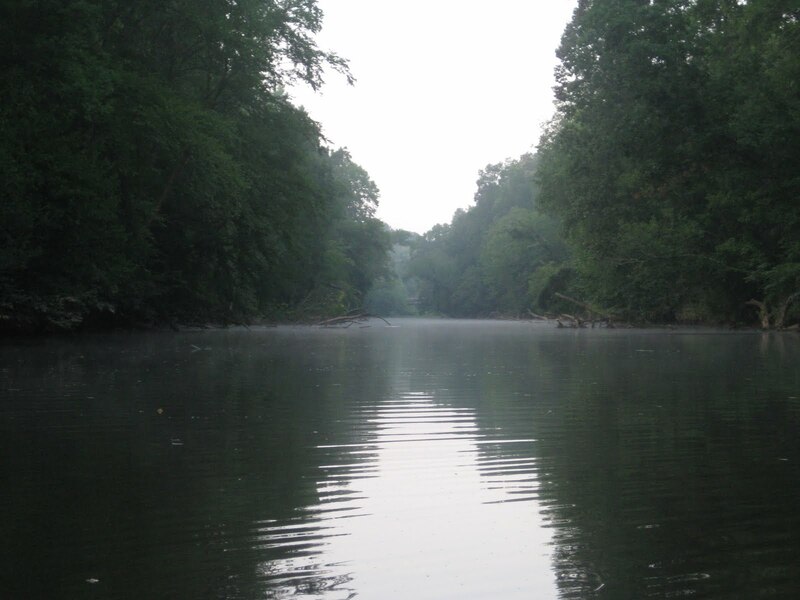 For me, if you can see the sun coming up, identify the color of your boat from 15 feet away, and make your way safely down river....then it is safe light. My day started slow and for quite some time it only got worse. In the first hour, my only bites were 8"-10" largemouths, none of which I could bring to the boat. Although I knew they would do me no good at the end of the day, it was still frustrating. Finally, I hooked into a good fish on a 10" Berkley Power Worm. I boated him and got him on the ruler - 16" and finally things were looking up....until the fish flopped off the measuring board and back into the water before I could get a picture. Two minutes later I landed a bass and got a picture. 12" was nothing special, but it was 12" more than I had all day. I was just starting to feel good...then three casts later I had what felt like a good fish run me into some heavy, heavy cover and come off. The bad luck continued! At this point, I realized having never fished that stretch before was catching up to me. Long stretches of shallow, swift water were clearly void of larger fish and it made me regret not focusing more on some areas I had quickly fished through earlier. I paddled to the other bank and after navigating some rapids found a creek that came into the river. On my first cast a fish blasted a 7.5" Culprit Original Worm on the fall and made a run for it. I knew it was big and a couple minutes later I had boated a 20" fish that was right around 5 lbs. I took a deep breath, and knew a couple more like that would put me in good shape. But, the big ones never came. I continued on, catching numerous fish in the 12" range on plastic worms. And, my bad luck continued, as I lost 4 fish that were all 15" or bigger. Before I knew it, we were at the end of the stretch and I was having second thoughts about numerous aspects of my day as I sat with 44". I decided at that point it was all or nothing, so I tied on a 5.5" swimbait and my favorite Strike King jig with a Paca chunk trailer. Over the last hour I was able to upgrade with a 12.75" and 15" fish. I was frustrated with my showing, but at least it was respectable given the brutal heat. In the end, 47.75" was good enough for 6th place in the Avid Angler division, which consisted of talented anglers from all over the southeast. My good friend Bob won with a total of 55.75" (special congrats to him) and second place was 52"...a total I would have surpassed had I caught a few breaks during the day. Thanks to Drew Gregory, BPS, The River Bassin Tourney Trail Crew, RiverBassin.com, Bob, Joey, Parker, and everyone else who made it a great event! 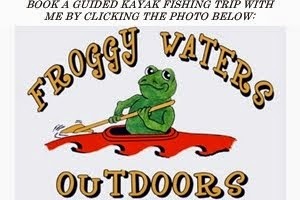 I am finally getting this site off the ground - with the main goal of sharing my fishing adventures. All of my trips (barring special occassions) are done from a kayak or wading, hence the man powered edition. I hope to share my experiences, knowledge, triumphs, and sorrows....because we know there are always a few that get away.